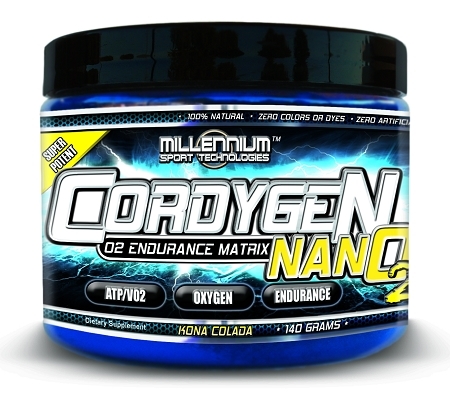 Cordygen-NanO2™ combines our exclusive OxyCeps-NanO2™ cordyceps extract & C-NanO2 Drive Matrix™ to create our fastest acting oxygen utilization and ATP supporting formula to date! 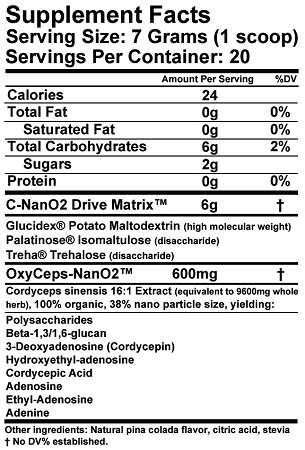 OxyCeps-NanO2™ is a powerful, 100% organic, 16:1 extract (equivalent to 9600mg of cordyceps whole herb per serving) of hybrid strain Cordyceps sinensis with a highly reduced particle size (38% nano particle). The higher concentration of active constituents provides superior performance while the reduced particle size ensures rapid absorption and action. **Cordygen-NanO2™ is formulated & manufactured without the use of any banned substances & is WADA & IOC compliant. *These statements have not been evaluated by the FDA. This product is not intended to diagnose, treat, prevent or cure any disease. Individual results will vary. Read the full product label for suggested use & warnings before using.